Scott Donie • Max Blog • Max. your best interest. 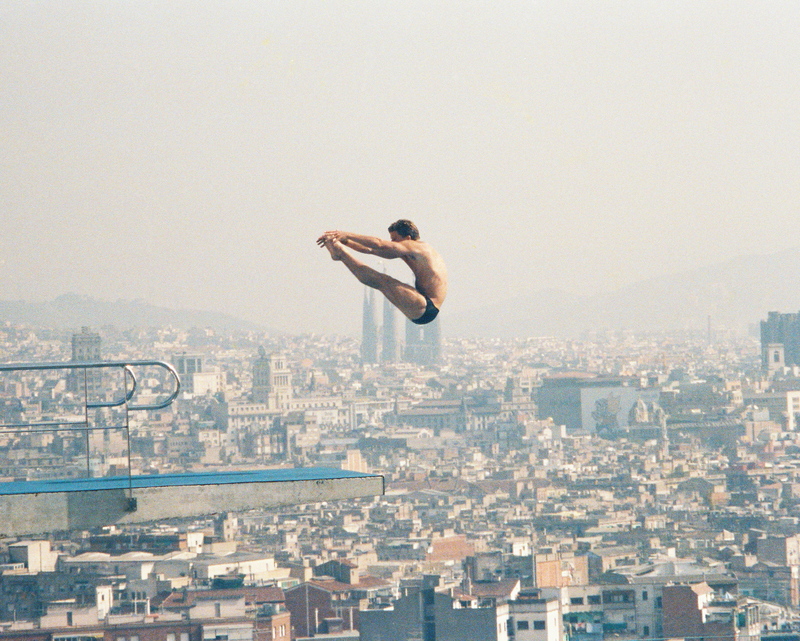 Scott Donie competes in the 1992 Olympics, high above the city of Barcelona. Photo Credit: Rol Donie. Many people work hard at a sport they love, but few achieve worldwide success. Why are these athletes different, and what can the rest of us learn from them? Max spoke with Olympic medalist Scott Donie, a diver who won silver at the 1992 Games in Barcelona. Now the head diving coach for both men and women at New York University, Donie also runs a diving-lesson program at local swim club Asphalt Green in Manhattan. He serves as a mentor for United States Diving, as well as speaking to audiences around the country about his sport. We asked Donie about his proudest and scariest moments as a diver, and what’s next for him. – Many amateurs enjoy their sport but don’t feel they can take it farther. How did you get serious about diving? One of my main motivations was always fear. I developed a severe fear of heights and water at a very young age. I still have a fear of heights! But then when I was 8 years old three things happened that changed my life forever. The first was discovering the sport of diving. I was on the swim team at my local summer club and I didn’t like swim practice. I started sneaking out in the middle of practice to jump off the diving board. The swim coach saw what I was doing and suggested that I ask to join the diving team. The second was getting a trampoline. My brother and I had been to a friend’s house who had a trampoline and we begged our parents for one until they finally relented. It came with one condition: we had to have trampoline lessons. The next thing I knew I was on that trampoline every single day. The third was seeing the Olympics for the first time. It was the 1976 Olympics and I saw Bruce Jenner win the gold medal in the decathlon. I remember watching as he ran a lap around the stadium waving an American flag. I felt like he had unified our entire country and in some sense the world in that moment. I didn’t know what the Olympics were but I knew I wanted to be a part of it. From that day forward I started telling everyone that I was going to be in the Olympics for diving. Luckily I had parents who were extremely supportive and coaches who also believed in me. – Aside from your Olympic medal, what’s your proudest diving-related moment? My comeback in the final season of my career. After winning the silver medal in 1992 I had a very difficult road back to the Olympics. I lost my way and became very disillusioned with everything. I suffered from severe depression and eventually I had a very public meltdown while competing at the 1993 Olympic Festival. I hadn’t been training properly and I was out of shape. In the middle of my handstand on the edge of the 10 meter platform I started to question everything. Why am I doing this? What is the point? Maybe I should do a spectacular cannonball! Of course the time to have such conversations is not while standing on your hands on the edge of a 10 meter platform. After about 40 seconds my arms pretty much gave out and I decided it was best to come down. I signaled to the referee that I was done and I walked down. I never competed again on the 10 meter. I ended up taking six months off and I got a job as a teacher. After a little time away I decided to come back to diving but to stay on the lower level of the 3 meter springboard. I was not ranked very high on this event but I worked my way up until I was among the contenders for a spot on the 1996 Olympic team. I ended up winning the Olympic trials and placing 4th at the Olympics. I am just as proud of that as I am of my season in 1992. – What’s the craziest thing that’s ever happened to you as a diver? – How do you use what you’ve learned in the pool in the rest of your life? What lessons can others learn? I have definitely learned a lot about fear. When I tell people that I am afraid of heights they always ask me, “How did you overcome it?” I tell them that I didn’t overcome it; I’m still afraid of heights. I felt that fear every time I climbed up to the 10 meter platform. And don’t ever ask me to join you for a hot air balloon ride! I think the key is to allow yourself to feel the fear. Fully acknowledge it. But never let that fear stop you from doing whatever it is that you want to do. Fear is actually there to help you and protect you. If you let yourself feel it you can use it to help you sharpen your awareness and your focus. If you are completely focused on what you’re doing the fear begins to work for you instead of against you. The same lesson can be applied to nerves. The thing I miss the most about diving? Getting nervous. In the beginning I would fight the nervousness and try to control it. That never worked for me. Then I came to understand that getting nervous was my body’s way of preparing for battle. I began to welcome the nerves and eventually I came to depend on them. – What’s next for you? We have a 9-year old daughter who keeps us pretty busy. She is into a lot of stuff and really enjoys gymnastics. She just joined the team at her gym so I will be supporting her on whatever path she chooses. I am excited to learn more about the gymnastics world as it is so directly related to diving. There is nothing a diving coach likes more than getting a student who comes from a strong background in gymnastics. I’d love to help foster better relationships between gymnastics programs and diving programs. I’d also like to start my own club program here in Manhattan. I’d like to help make the sport of diving available to everyone. Max helps you earn dramatically more on your cash, without switching banks. Max also helps you obtain more FDIC insurance coverage, up to $1.5 million per individual or $6 million per couple. Start with your existing checking or brokerage account, and then link additional higher-yielding savings accounts at some of the nation's leading FDIC-insured online banks. Max keeps an eye out for changes in interest rates, helping your money automatically flow to the banks that offer the best rates, while keeping your balances below the FDIC insurance limit at each bank. Max also helps you maintain a target checking account balance each month. Max lets you see all balances on one screen, transfer funds with a single click, and obtain all 1099-INT tax forms in a single PDF.